Do not overtighten when using a vise. When installing, coat the parts indicated by the arrows with power steering fluid (see page 51-7 ). (a) Remove the clip and disconnect the oil reservoir to pump hose No.1. NOTICE: Take care not to spill fluid on the V belt. (a) Using a wrench (27 mm) to hold the pressure port union, remove the union bolt and the gasket. (a) Disconnect the connector from the oil pressure switch. (b) Using SST and a deep socket wrench (14 mm), loosen bolt A. (c) Remove bolt B and the vane pump assy. (a) Using SST, hold the vane pump assy in a vise. (a) Remove the bolt and the suction port union. (b) Remove the O-ring from the suction port union. (a) Remove the pressure port union. (b) Remove the O-ring from the pressure port union. (c) Remove the flow control valve and the compression spring. NOTICE: If the oil pressure switch is dropped or damaged, replace it with a new one. (a) Remove the 4 bolts and the housing rear from the housing front. (b) Remove the O-ring from the housing rear. (a) Using 2 screwdrivers, remove the snap ring from the w/ pulley shaft sub-assy. (b) Remove the w/pulley shaft sub-assy. (a) Remove the 10 vane pump plates. (b) Remove the vane pump rotor. (a) Remove the side plate front from the housing front. (b) Remove the O-ring from the side plate front. (c) Remove the O-ring from the housing front. (a) Using a screwdriver, remove the housing oil seal. NOTICE: Be careful not to damage the housing front. (a) Using a micrometer and a caliper gauge, measure the oil clearance. 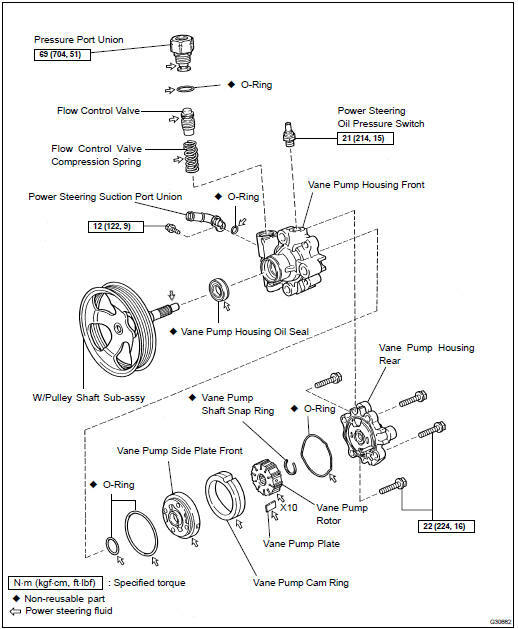 If it is more than the maximum, replace the vane pump assy. (a) Using a micrometer, measure the thickness of the vane pump plates. (b) Using a feeler gauge, measure the clearance between a side face of the vane pump rotor groove and the vane plates. If clearance exceeds maximum, replace the vane pump assy. (a) Coat the flow control valve with power steering fluid and check that it falls smoothly into the flow control valve hole under its own weight. If it lacks smoothness, replace the vane pump assy. (b) Check the flow control valve for leakage. Close one of the holes and apply compressed air, 392 to 490 kPa (4 to 5 kgf/cm2, 57 to 71 psi), into the opposite side hole, and confirm that air does not come out from the both end holes. If air leaks, replace the vane pump assy. (a) Using vernier calipers, measure the free length of the compression spring. If it is less than the minimum, replace the vane pump assy. If the union seat in the pressure port union is severely damaged, it may cause fluid leakage. In that case, replace the vane pump assy. (a) Coat a new housing oil seal lip with power steering fluid. (b) Using SST and a press, install a new housing oil seal. NOTICE: Make sure that the housing oil seal is installed in the correct direction. (a) Coat bushing surface of the housing front with power steering fluid. (b) Gradually insert the w/pulley shaft sub-assy from the pulley side. Do not damage the housing oil seal lip in the housing front. After inserting the w/pulley shaft sub-assy, check that the oil seal lip faces in the correct direction. (a) Coat a new O-ring with power steering fluid and install it into the housing front. (b) Coat a new O-ring with power steering fluid and install it onto the side plate front. (c) Align the dent of the side plate front with that of the housing front, and install the side plate front. (a) Align the dent of the cam ring with that of the side plate front, and install the cam ring with the inscribed mark facing upward. NOTICE: Make sure that the cam ring is installed in the correct direction. (a) Install the vane pump rotor. HINT: Vane pump rotor has no specific direction. (b) Coat 10 vane pump plates with power steering fluid. (c) Install the vane pump plates with the round end facing outward. (a) Using a screwdriver and a snap ring expander, install a new snap ring to the w/pulley shaft sub-assy. (a) Coat a new O-ring with power steering fluid and install it onto the housing rear. (b) Align the straight pin of the housing rear with the dents of the cam ring, side plate front and the housing front, and install the housing rear with the 4 bolts. (a) Check that the pump rotates smoothly without abnormal noise. (b) Temporarily install the service bolt. (c) Using a torque wrench, check the pulley rotating torque. If the rotating torque is not as specified, check the housing oil seal. (a) Coat a new O-ring with power steering fluid and install it to the oil pressure switch. (b) Install the oil pressure switch onto the vane pump assy. (a) Coat the compression spring and the flow control valve with power steering fluid. (b) Install the compression spring and the flow control valve. (c) Coat a new O-ring with power steering fluid and install it onto the pressure port union. (d) Install the pressure port union. (a) Coat a new O-ring with power steering fluid, and install it to the suction port union. (b) Install the suction port union with the bolt. (a) Temporarily tighten bolt A to the vane pump assy. (b) Install the vane pump assy and bolt B. (c) Using SST and a deep socket wrench (14 mm), tighten bolt A. Use a torque wrench with a fulcrum length of 345 mm (13.58 in.). This torque value is effective when SST is parallel to a torque wrench. (d) Connect the connector to the oil pressure switch. (a) Install the pressure feed tube assy and a new gasket to the vane pump assy with the union bolt. HINT: Make sure the stopper of the pressure feed tube assy touches the housing front as shown in the illustration. (b) Using a wrench (27 mm) to hold the pressure port union, torque the union bolt. (a) Connect the oil reservoir to pump hose No.1 with the clip.